Come one, come all, to the biggest circus in town, ADWV’s Under the Big Top Dance Camp!! Have you ever dreamed of running away with the circus? Well now is your chance! At this camp, your dancer will study the art of jazz, musical theater, contortion and acrobatics to put on the greatest show on earth! 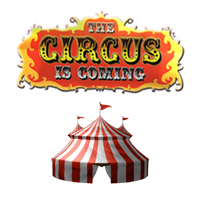 Our circus performers will learn what it takes to perform under the big top and they will even be making their very own props and costumes for the big show at the end of their camp! We are certain their performance will wow the crowd and leave you begging for more!